I’ve enjoyed my career as a middle-school science teacher and a professional football player, thanks to passion, hard work, and good advice like this. That’s why I reached out to some of the most inspiring young minds involved with the U.S. Department of Energy Solar Decathlon to share their advice for science, technology, engineering, and math (STEM) students like mine. These collegiate teams, who are working to design and build solar-powered sustainable houses that will go head-to-head in 10 contests, could probably teach Einstein a thing or two. As a second-year long snapper with the Denver Broncos, Casey (third from left) brings passion to everything he does, both on and off the field. One team encourages kids not to be fooled by what’s cool. “STEM careers can be really creative. There isn’t anything boring or stuffy about studying the world around us and finding new ways to make that world better,” says Team Alabama. For the Solar Decathlon 2017 competition, Team Alabama designed surviv(AL) house to help communities address some of the most destructive events on earth—tornadoes. This team is using engineering and technology to design a safe room at the heart of their house, which can withstand 250-mile-per-hour (mph) winds. That’s faster than the top speeds of an Apache helicopter, a Peregrine falcon, or an arrow shot from a bow! Most building codes only require homes to withstand 70 mph winds, but Team Alabama’s ideas can even stand up to EF-5 tornadoes. The University of Alabama at Birmingham and Calhoun Community College are constructing the surviv(AL) house for the U.S. Department of Energy Solar Decathlon 2017. Inspired by the devastating impact of the 2011 tornadoes that struck Alabama, the team is designing surviv(AL) to withstand extreme weather events in a home that is both affordable and suited to the southern climate. The Solar Decathlon team from the University of Nevada Las Vegas found that inspiration is all around them. They set out to solve a problem that’s much more common, and becoming more so every day, to inspire change on a large scale. Team Las Vegas saw that the homes in their community aren’t designed to fit the needs of an increasing elderly population. Active seniors need solutions that can allow them to stay at home, or age in place, well into the sunset of their lives. That’s why Team Las Vegas designed its Sinatra Living House with accommodations such as a fall detection alert system, adjustable countertop heights, and non-slip flooring. “Our team believes that STEM not only gives students the opportunity to do something really interesting, but also make a difference,” says Team Las Vegas. And if you don’t know who Frank Sinatra is, YouTube him immediately! The University of Nevada, Las Vegas team is building a sustainable, “age-in-place” home for the U.S. Department of Energy Solar Decathlon 2017. The Sinatra Living house combines the history of the past with the technology of the future by blending nostalgia for the 1950s and ’60s in Las Vegas with modern renewable energy and energy efficiency technologies and sustainable materials. Nobody ever said making the world a better place is going to be easy. “It’s going to seem hard sometimes,” says Team Daytona Beach. “Everyone hits a point with STEM where they get stuck—whether it’s a problem they can’t solve, a theory they can’t understand, or a new piece of technology. You must keep pushing forward because the reward of getting over that roadblock is worth it.” This team did just that as they considered ways to avoid wasting water and energy in their BEACH House. They designed a new kind of indoor gardening, or hydroponic, system that uses collected rainwater to grow leafy vegetables and herbs year-round without impacting Florida’s water systems. Even with big ideas like these, sometimes it’s good to smart small. “Learn the basics, even if it seems boring, and then apply that knowledge to larger (and cooler) projects,” says the Northwestern team. This group of students went back to the basics and created imaginary friends to focus their ideas in the beginning. They made up hypothetical clients, named Michael and Lisa, to help them understand what their house needed to do for its owners. Lisa and Michael are typical Chicago-based baby boomers who care about maintaining good health. That’s why the House by Northwestern team added technologies that filter out nasty particles such as volatile organic compounds (VOCs) and dust, while also monitoring air quality aspects like carbon dioxide (CO2) and humidity levels in their Enable House. Knowing the average person takes about 20,000 breaths a day, scientific applications like this can help you breathe a little easier—if you are real, that is. For the U.S. Department of Energy Solar Decathlon 2017, Northwestern University is designing a high-performing, sustainable house that is well-adapted to the harsh Chicago climate with minimal impact on its surrounding environment—including energy, water, waste, and the ecosystem. Enable by the House by Northwestern team will connect Chicago’s rich traditions in architecture and innovation to the promise of the future. And if you’re dreaming big already, it’s important to plan your next steps. “Coming from a school of mostly STEM students, our advice would be to get involved! Talk to your teachers about science fairs, or join a science club that interests you. There are tons of opportunities around you, and seeking them out is always the first step to doing something awesome,” says Team Missouri S&T. One such opportunity is taking place right here in Bronco country. Eleven collegiate teams, including the five mentioned here, are competing in Solar Decathlon 2017, which is being held in Denver for the first time in its 15-year history. This event is open to the public free of charge October 5–9 and 12–15 at the 61st & Peña Station on the University of Colorado A line near Denver International Airport. 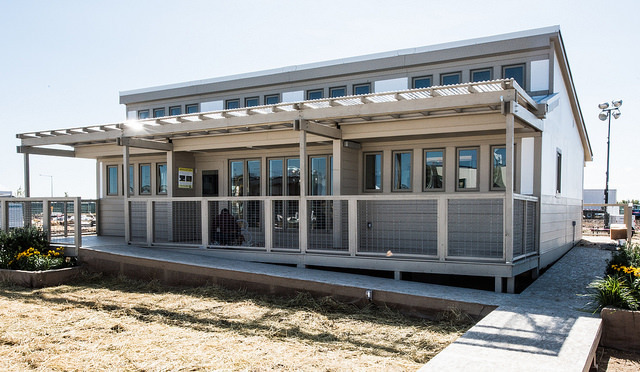 Solar Decathlon provides some incredible opportunities for K-12 education. Local middle-school groups have been invited to the event site for Education Days. 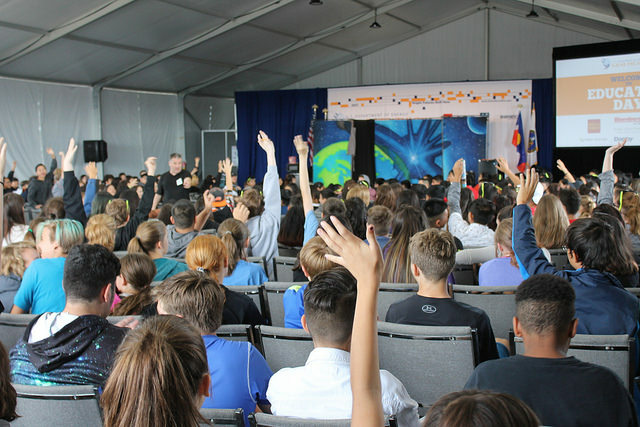 This hands-on field trip allows sixth- through eighth-grade students to ask questions of a dedicated volunteer “mentor” guide, tour the Solar Decathlon team houses, interact with the collegiate teams, and participate in an hourlong energy workshop. Today, the students from Jeffco schools got to ask questions of Colorado Senator Michael Bennett. And they were tough questions! Not in town? No problem. There are Solar Decathlon Educator Resources focused on solar energy and energy efficiency, including activity guides for educators to implement high-quality energy education in the classroom or after school environment. And for those looking to push the boundaries of STEM, check out the Solar Decathlon’s first Virtual Visit experience, where you can take 360 tours of the houses, view a live stream from the site, and more. 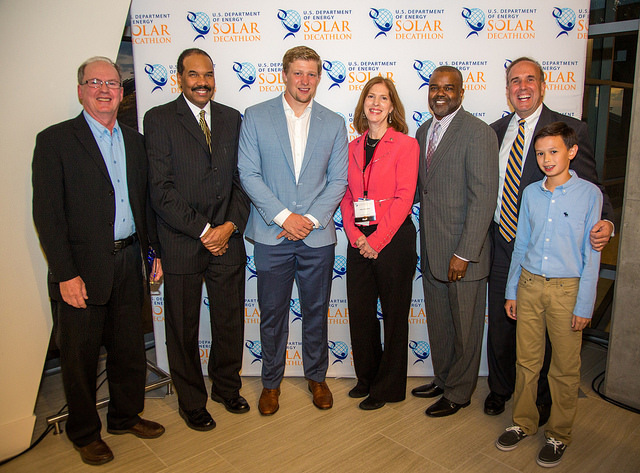 Fostering the next generation of problem-solvers is one of the most important aspects of this competition, so I couldn’t be more excited to support all of the students who are learning about sustainability at Solar Decathlon 2017. A brand new passion for STEM is just waiting to be discovered in this solar village. 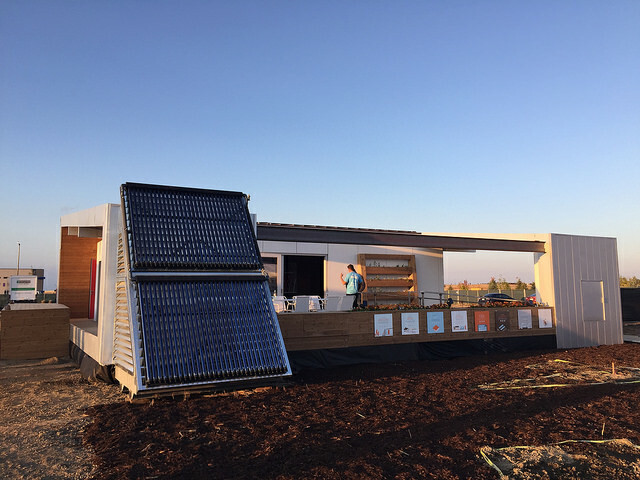 This entry was posted on Friday, October 6th, 2017 at 5:38 pm and is filed under Events, Las Vegas, Missouri S&T, Northwestern, Solar Decathlon, Solar Decathlon 2017, Team Alabama.